On this reference page are direct links to heat pump air handlers and indoor evaporator coils. High efficiency blower units and single cased or uncased coils need a compatible outdoor condensing unit to work properly. Heat pump fan units and evaporator coils. Amana:Air Handler For New Or Retrofit Installations | Looking for an air handler that is compatible with new or retrofit installations? Your search ends with the multi-position AVPEC Air Handler from Amana. Armstrong:Armstrong Air advanced variable speed packaged units keep the comfort flowing with outstanding efficiency and comfort. Broan HVAC:Air Handlers | Split Systems | Broan HVAC | Are you looking for the indoor match to your outdoor air conditioner or air handler? Check out Broan's high-quality indoor air handling units. Carrier:Our fan coils and other Carrier cooling products will help push your cooling systems efficiency to its highest level. Contact us or order today! Goodman:Air Handlers | HVAC | Heating and Cooling | Find the best selection of quality Air Handlers at Goodman Air Conditioning & Heating. Learn more about Goodman Air Handlers and other HVAC products today! Grainger:An air handler is an essential part of your heating, ventilating, and air-conditioning system. When you need HVAC equipment, make Grainger your go-to source! Heil:Evaporator Coils | Heil offers evaporator coil products. Learn about the features and benefits of the evaporator coils and find a dealer nearby. Lennox:What is an Evaporator Coil? | Lennox Residential | Editor's note: Nice article on the function and operation of an indoor heat pump or air conditioning refrigerant coil. For more information on this article go to indoor heat pump air handlers at https://www.lennox.com/products/heating-cooling/air-handlers. Maytag:Air handlers vs gas furnaces! Which should you choose for your home? Here, we break down all you need to know about both of these units. | Editor's note: Good blog on air handlers and gas furnaces. For more information on this article go to air handlers at https://www.maytaghvac.com/Air-Handler-Coil. Mitsubishi Electric:Ducted Air Handler. Tie into existing ductwork, replace your furnace and immediately reduce your energy usage by up to 40% with our Multi-Position Air Handlers. Payne:Payne offers dependable, affordable and energy efficient heating fan coil units. Learn more about our fan coil unit line and the 10 years limited warranty they come with. Tempstar:Tempstar offers evaporator coil products. Learn about the features and benefits of the evaporator coils and find a dealer nearby. Trane:Trane's Comfort™ Coil is the HVAC evaporator coil you need for your heating and cooling system. Talk with a Trane Comfort Specialist to learn more today! Heat pumps don't actually pump heat, they absorb cold air and extract the remaining heat. Heat pump air handlers can have a flat, slant or A-coil inside them. Indoor blower units can be mounted vertically and horizontally. Some models can also be installed down flow with the return air on top and supply on the bottom. High efficiency heat pump air handlers use a variable speed fan. This allows the system to produce a constant recirculation of heat or cooling depending on the temperature setting differential. Single speed blowers shut down immediately once the thermostat is satisfied; leaving useful, conditioned air uncirculated. This reference page has an index that will guide you directly to heat pump indoor air handlers and blower coils online. This web page focuses on indoor heat pump units and systems. 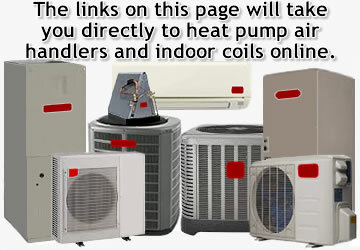 This site was developed to assist in finding or researching a heat pump-related item or topic. Heat pump air handlers are also call indoor unit, fan coil, blower unit, A-Coil, and electric furnace.